Last Sunday (January 25) I began the observance of Catholic Schools Week with a Mass for Our Lady of Guadalupe School in Fremont. I had recently dedicated the new church in December, but this was the first time I could see it in daylight, and appreciate the stained glass windows. The students provided the choir and music for the Mass, under the direction of Sister Janice, O.P., the principal. In my homily I told the students how much Catholic education had done for me in my life. Here I am with the Student Council. On Wednesday we continued the celebration of Catholic Schools Week with Mass for all 800 students, and staff, of Carondelet High School in Concord. It was my first visit to the school. The young women were exceptional in their respect and reverence during the Mass. I could see how carefully their campus minister had prepared the servers and readers, and the wonderful music, for the Holy Mass. Since it was the Feast of St. Thomas Aquinas, patron of education, I spoke to the girls about the difference between Intelligence and Wisdom, and how the difference was portrayed in one of my favorite shows, Downton Abbey, and the film The Imitation Game. The faculty and staff of Carondelet are doing an excellent job of forming young women to be friends and disciples of Jesus Christ. 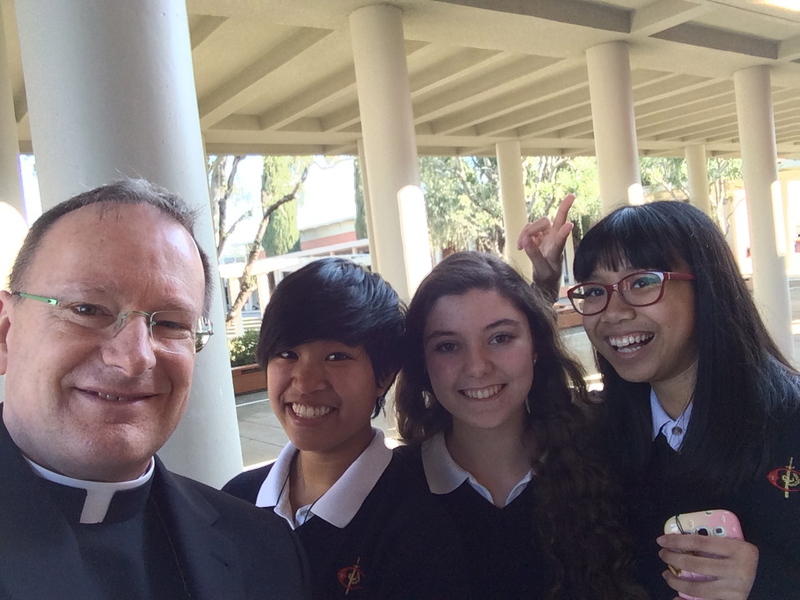 Here’s a selfie with a few of the Carondelet students. Later on Wednesday I traveled to St. Patrick’s Seminary to deliver a talk during Compline (Night Prayer Service) for the Order of Malta. I spoke to them about Pope Francis’ devotion to Our Lady, Undoer of Knots. I have never heard of that particular devotion in the USA (it originated in Bavaria, Germany). Here’s a photo of the painting of Mary taking the knots out of a Bavarian marriage ribbon. The story goes that a couple who had been considering divorce went to a Jesuit priest for counseling. They brought him the ribbon which had been used to join their hands in the German custom during their nuptial Mass. The priest prayed to Mary to help them, and as he untied the last knot in the ribbon, it suddenly glowed white. They took it as a sign from Our Lady, and the couple stayed together. Archbishop Broglio brought a copy of the painting from Germany to Argentina, and the devotion spread. 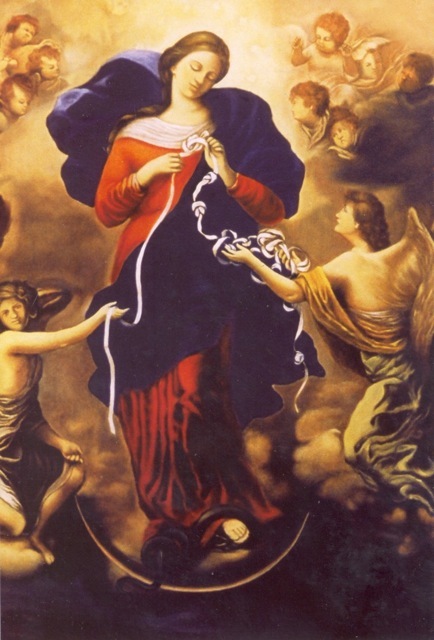 May Our Lady, Undoer of Knots help us undo the knots in our lives. 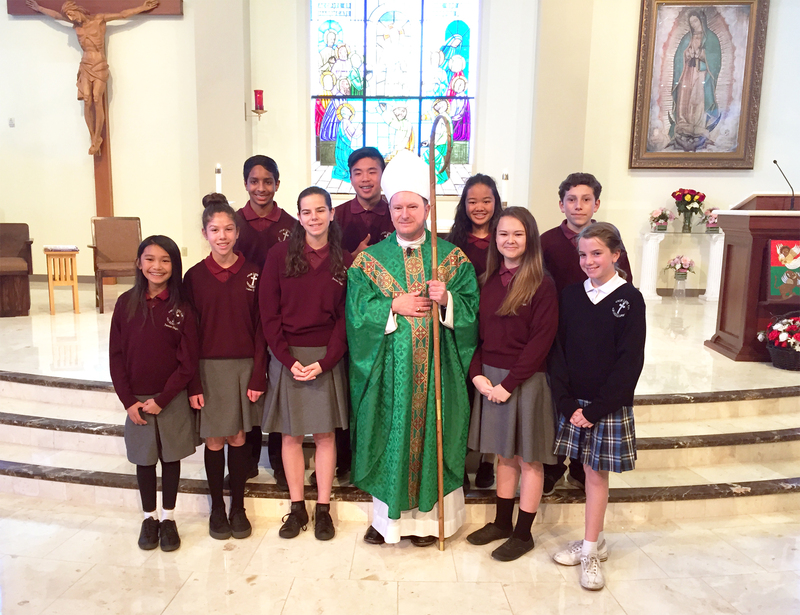 On Thursday I visited the School of the Madeleine in Berkeley and celebrated Mass for them. 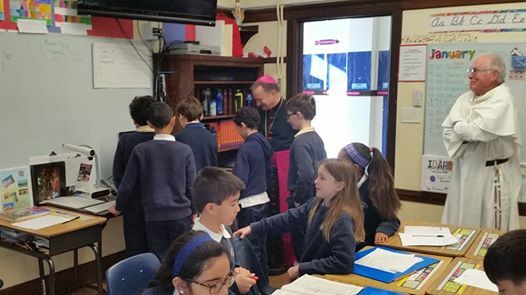 The Fifth Grade designed a virtual cathedral on their class computer which they delighted in showing me. They also designed a ship and named it the USS Barber. I told the teacher to give them each an A+! I then went over to the UC Berkeley campus to do something I’ve wanted to do ever since becoming bishop. 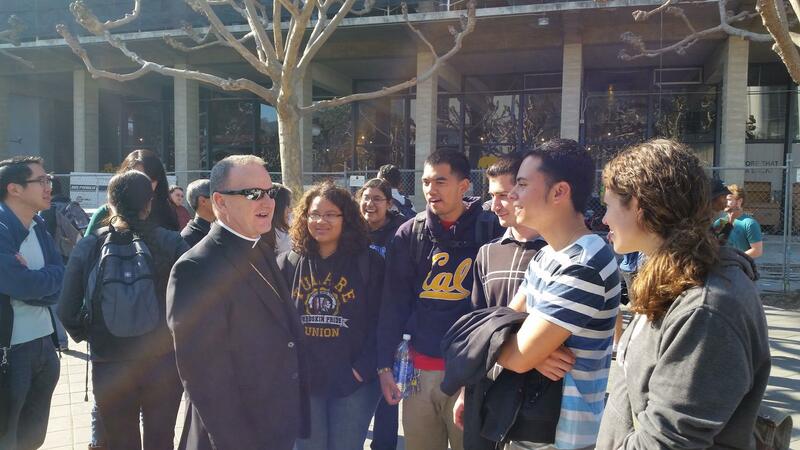 I wanted to stand with the Catholic students in Sproul Plaza, heart of the campus, and witness to the Catholic faith. St. Paul himself preached in the central marketplace of Athens on behalf of Jesus. Our “Catholics at Cal” regularly set up a table, hand out brochures with Mass times, give holy cards, and most importantly, present a friendly and welcoming face on behalf of Christ and His Church. I am so proud of these students, and their Paulist chaplains who support them. It was fun! On Friday I was invited to a reception to meet the new mayor of Oakland, the Hon. Libby Schaaf. Fr. Jay Matthews, our new Rector of the Cathedral, accompanied me. Leaders of all faith groups in Oakland were invited. The mayor is very personable and told us of some of her priorities: affordable housing, reconciliation in the community, improvement in education – especially for Pre-K children. 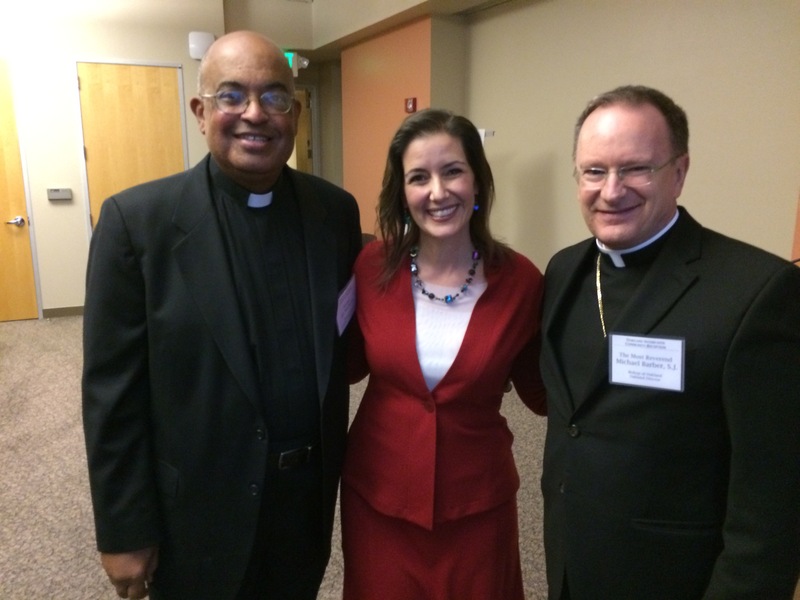 It was also one of the first opportunities I had to meet representatives of so many churches and faiths in Oakland. It was a very positive and hope-filled evening.